For the couscous, place the couscous into a bowl and cover with the hot stock. Cover the bowl with a plate or cling film and leave for four minutes. Uncover the bowl and fluff up the couscous with a fork. Stir in the remaining ingredients, season to taste with salt and freshly ground black pepper. For the kebabs, preheat a griddle pan over a medium-high heat. Toss all of the kebab ingredients together and season to taste with sea salt and freshly ground black pepper. Thread the ingredients onto metal kebab skewers and cook on the hot griddle for 5-6 minutes, turning frequently. For the salsa verde, place all of the salsa verde ingredients, apart from the olive oil, into a food processor and blend, gradually adding the oil until you have a loose paste. 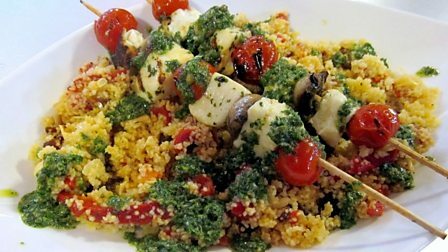 To serve, spoon the couscous onto plates, top with the kebabs and drizzle with the salsa verde.